The contrast was striking. The setting was the placid, bucolic Bent Pine Golf Club House at Vero Beach, Florida. 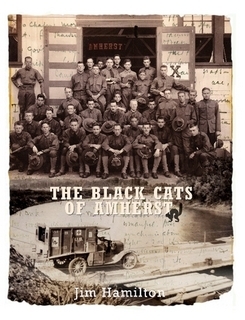 The topic was the so-called Black Cats, a group of ambulance drivers in World War One, many of whom were students or graduates of Amherst College, which I, too, attended somewhat later. Their wartime experience was harrowing, their performance heroic. 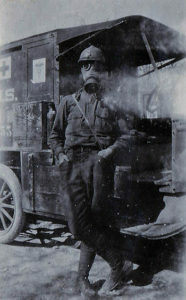 The ambulance was as vital as the trench in this war to end all wars. Another Cat noted: “We have become denizens of the underworld. We live in holes in the ground, eat there, sleep there.” But the Cats learned to adjust, even be comfortable. It was war, after all. They drove make-shift ambulances, often converted Model-T Fords that offered a rough ride for the painfully wounded. Many died on the way because first-aid stations were distant and roads impenetrable. Shell holes below, fresh shells coming in. Hugh described a 72-hour tour of constant driving, loading and unloading with a leaking radiator, punctured tires that had to be changed, a mist so heavy he couldn’t make out the road he had traveled many times. Then there was the poison gas. A Cat wrote his mother: “The gas made me dippy, gave me a headache and made my eyes smart. I wore my gas mask until the smoke from the shelling got so thick I couldn’t see.” Sometimes it was impossible to drive with the mask on. You had to take your chances. The Cats were appalled by the bombing of civilians, a matter of routine in the world war to follow. But their spirits lifted as U.S. troops went on the offensive, and with the armistice and victory, they were exultant. They had survived, and their cause was a worthy one. No regrets. Hugh and others returned to their Amherst studies, which, to be sure, were never quite the same. War is its own education. It was great meeting you in Vero Beach. Many thanks for the write-up!